You are how you think. So, why not discover more about you? 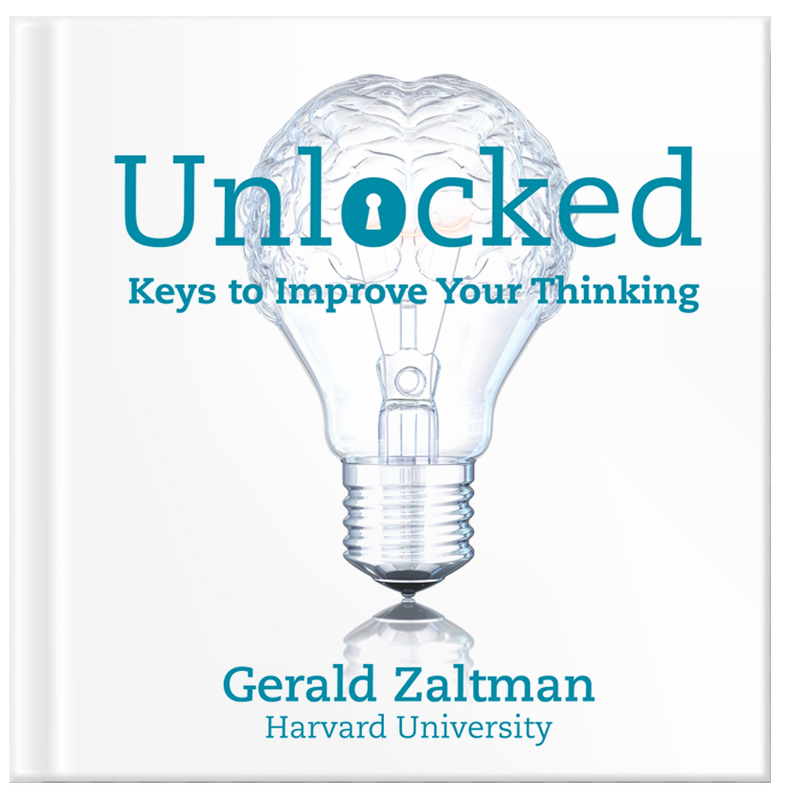 Unlocked has 39 fun, fact-based keys to improve your thinking. You can make a difference in other people’s lives by participating in our matching book donation program. Purchase and donate to an educational program for teens or adults one or more copies of Unlocked: Keys to Improve Your Thinking, and we will match your donation. If there is one question that the 7.6 billion people on Earth today will all ask in their lifetime, it is: Who am I? An exploration of how you think is a step toward answering that question of self-identity. In his earlier books, Jerry Zaltman taught us how to think more vividly. In Unlocked, he teaches us how to think more clearly. In these times, developing our critical-thinking skills could never be more important. Prof. Zaltman offers nuggets of knowledge that beautifully illuminate the nature of our minds. This book succeeds because it shows more than it tells, allowing the reader to reach insights and appreciate the strengths, limitations, and quirks of his or her own mind. This warm and stimulating book is as much fun to read as it is stimulating and informative. "A bountiful mind, like a garden, requires careful tending." Most of the time, if we think about our thinking at all, we focus on what we think. Unlocked is about how we think. It explores a variety of forces that shape our thoughts and feelings. These forces are typically invisible. Even when visible, they are easily overlooked. Unlocked reveals them. Unlocked introduces you to your mind. By exploring how you think, you are also exploring who you are. The introduction will be a pleasant, even fun, learning experience. And it will contain lots of surprises, regardless of your age, occupation, or education. Unlocked is for anyone who is curious about themselves. Hopefully, that includes you. It is for people who dare to explore the typically hidden processes shaping their thinking and who they are. Why is exploring how we think important? Have you ever regretted a decision? Or asked, “Why didn’t I think of that?” Or realized that you were flat-out wrong about something important? Of course you have. C’mon. Admit it. How you think determines the quality of what you think and what you do. Flawed thinking produces flawed outcomes. These outcomes reflect back on who you are. Unlocked reveals ways of spotting and correcting for weaknesses in how you think, which can improve your decisions and actions. Who doesn’t want that? Unlocked uses activities called Think Keys to explore thought processes. Each Think Key begins with a statement about how we think. Next, an interesting, fun activity is presented to illustrate that process. Then, the point of the exercise is made clear. Finally, the question “So What?” is answered. Once a Think Key tickles your curiosity, you’ll be hooked on exploring how you think. The Think Keys are organized around eleven topics, including context, memory, attention, curiosity, metaphors, and several others. Each is explored from different perspectives. The Think Keys are not tests with right or wrong answers. They’re open-ended explorations, an adventure. Are the Think Keys to be done alone or with others? They can be used in class, at family dinner, in training programs or other work settings, or in book clubs and other social settings. Or you can engage with them all by yourself. I suggest doing them on your own, reflecting on your insights, and then sharing your experience with others. Learning how others respond to the Think Keys is very helpful in understanding your own thinking. Book clubs report that reading Think Keys privately a day or so before a group discussion of them works well. It seems that reading them alone and discussing them later is like letting a tea bag steep before drinking the brew. The initial ideas a Think Key stimulates have a chance to develop further before being shared with others. What if I have suggestions or questions? When comments or questions seem like they might be helpful to others, I may ask your permission to share them via this website.